Some of my golf students have difficulty understanding the concept of body rotation through impact plus extending down the line after impact. 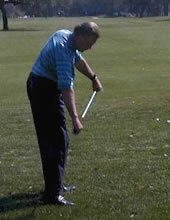 The need to clear the hips while making sure your club is extending down the target line can be difficult to understand as well as to execute. 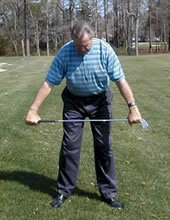 Recently while waiting to tee off I casually started to perform a stretching motion with my hands on each end of the club and then had an epiphany! 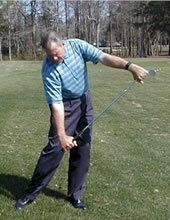 Now slowly swing back until you reach a full shoulder turn. 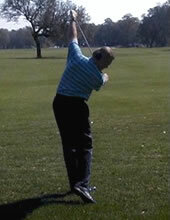 You will notice that my right arm is extended away from my body and the shaft should be on a angle that would point down to the ball as in picture #4 (below, right). 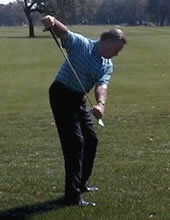 Pay close attention to what this position feels like at the top of the backswing. It's almost impossible to "reverse pivot" (or tilt your spine so that the weight moves to your front foot) doing this part of the drill. 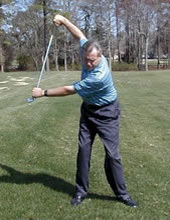 As you bring the shaft down and through, the shaft must point in the direction of the intended flight of the ball (see picture #6, below right). 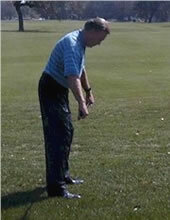 You will notice that although my hips are rotated around to the left my shoulders are parallel to the intended line. And my eyes are still looking down at where the ball was. 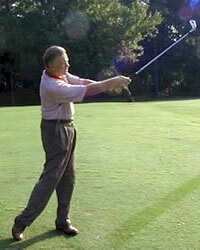 By swinging a club like this in your living room or back yard you will learn how it feels to clear the hips and keep the shoulders parallel to the target through impact. It is key to good shotmaking.